When you run Do you kick or scrape the inside of your ankle with the other foot ? Do you kick or scrape the inside of your ankle with the other foot ? Runner's pathologies creep in as the miles go up, fatigue can be a variable in biomechanical breakdown. Some of you who have been with us for years have seen this picture. 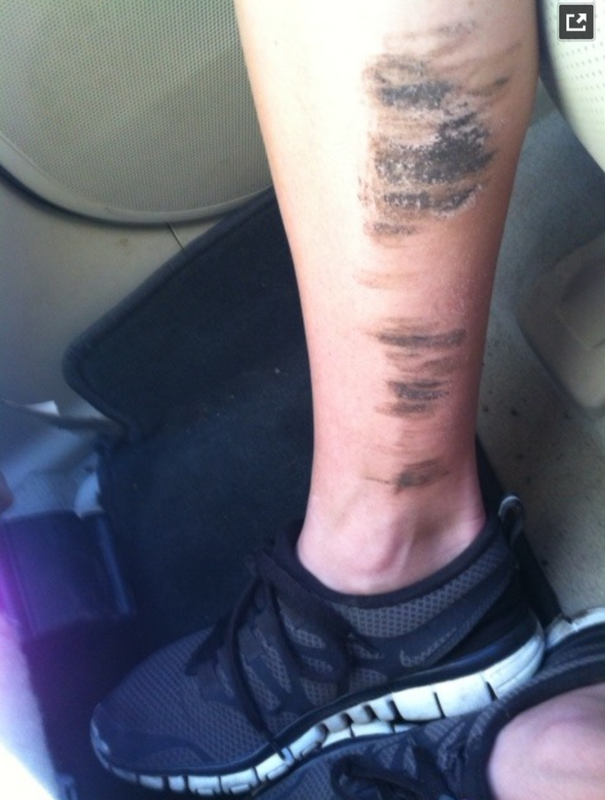 This young runner had these scuff marks on the inside of the right lower leg and ankle after a cross country meet. So what is going on here and what does it tell you ? Some runners notice that they repeatedly will scuff in the inside ankle or inner calf with the opposite shoe when running. This can happen on both sides but it is more often present unilaterally than bilaterally. 1- cross over gait (if you are new to our blog in the SEARCH box type in “cross over” and “cross over gait” and be sure to see our 3 part video on the cross over on our youtube channel found here). 2- negative foot progression angle which may or may not be combined with a degree of internal tibial torsion. Said easier, the runner is “in-toed” or “pigeon toed” but if you have been here with us awhile on The Gait Guys we expect a diagnosis of a higher order so use the former terms, please. 1- Cross over. When the runner is standing on the right leg, right stance phase of gait, the frontal plane is not properly engaged and the pelvis can drift further over the right foot. This drift to the right will drop the pelvis on the left side. This will alter the pendulum movement of the left leg. Since the global pelvis is moving to the right the left swing leg pendulum moves to the right as well and as it swings past the stance leg it strikes a glancing blow to the inside of the right ankle or calf. This is simple biomechanics and physics. To fix this problem, which is clearly inefficient, one has to determine what is causing the right pelvis drift (there are many causes, the most often thought of cause is a weak gluteus medius on the right but if you have been here with us awhile you will know there are other causes) and then fix the drift. Do not assume it is the gluteus medius all the time, for if it is not, and you employ more glute medius exercises you could be ignoring the source and building a deeper compensation pattern. Fix the problem, not what you see. 2- Negative foot progression angle and/or internal tibial torsion. In order to fix this you have to know first if you are dealing with a fixed/rigid anatomic tibial or femoral torsion issue which cannot be fixed or if you are dealing with a flexible progression angle issue. Often, “in-toeing” is accompanied with internal tibial torsion, this is because the knee has to progress forward to keep its tracking mechanics clean, if you correct someone’s foot progression back to neutral and they have internal tibial torsion then you have dragged the patellar tracking outside the normal sagittal progression angle, knee pain will ensue. In fact, the foot progression on the ankle is normal, but the tibia or femur are merely torsioned in a manner that drags the foot inwards with the long bone orientation, again, this is driven by a higher order/demand, to normally track the patella sagittally (forward). However, if this is a pre-puberty individual you have time because the long bone derotation process is still occuring. Give homework to encourage a good foot tripod and work to strengthen the external hip rotators and encourage sagittal knee tracking mechanics. This is a delicate balancing act, but it can be done, but it is a monster of a project for a blog post because each case is different, variable and always changing depending on the client progress. Remember, you can only encourage more appropriate mechanics and hope that the body will embrace some of the change and encourage some of the de-rotation process to occur from the long bone growth plates. The “inside scuff”, to identify its solution you have to know the cause. After all, if it was as easy a fix as “stop doing that” no one would be doing it and we would be out of a job. Nov 12, 2011 Running barefoot: Saving money or spending it on the doctor ? & How to Cycle shoes !